Beyond Beauty : If the world was supposed to end, what would you like to buy for yourself before it happens?? Check out what Ray got for herself! 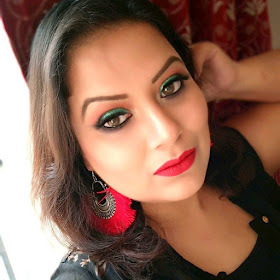 Life is Crazy : Red on her nails... review of Maybelline nail colour by Rajani. My Noble Secrets : Radha Reviewed her Aloevera Face pack that clears her blemishes and pimples. Our External World : Not to be missed fun contest where you can win not makeup but a braganizer - a unique product you will love to have - open worldwide! voiceofrm : Teal and Grey simple EOTD.